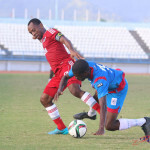 Reigning Pro League champion team, Defence Force, was left with little doubt about the scale of its 2014 mission this evening as the army/ coast guard combination returned to active football duty with a 2-0 loss to Central FC at the Ato Boldon Stadium in Couva. Coach Ross Russell’s men held their first training session in a month last Thursday, after being suspended from the game in a kneejerk reaction to the sharp murder rate at the start of the year. And the inevitable rust meant that Defence Force probably did as well as could have been expected today. 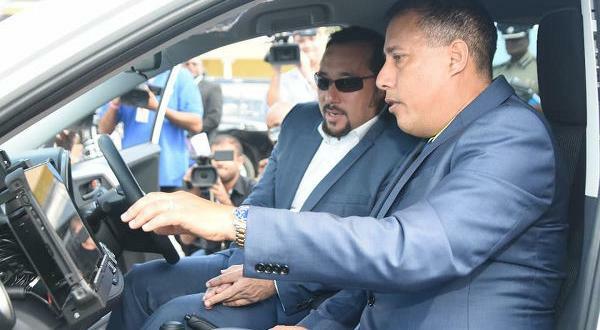 Central got a contest but the “Couva Sharks” were always favoured to leave with the three points at stake and did not disappoint. It was the second successive win for Central whose boast of being unbeaten for 2014 initially sounded hollow on the back of six successive draws. Photo: Central FC striker Willis Plaza (centre) tangles with North East Stars midfielder Keithy Simpson (left) while Marvin Oliver looks on. Plaza created Central’s opening goal this evening against the Defence Force. Now, the Sharks are third in the standings; although they have played a game more than Police FC, North East Stars and Caledonia AIA and two of those three teams can overtake them with a victory later this week. Central coach Terry Fenwick was not on the sidelines as he is on pressing family business in England. 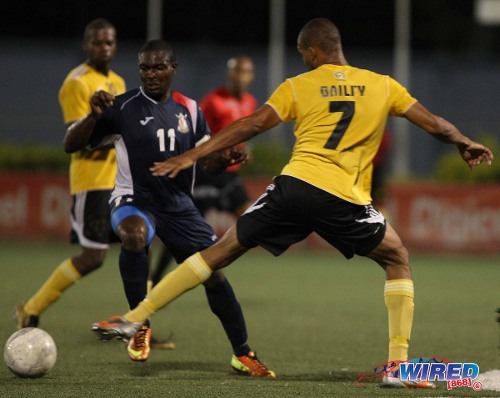 Central’s versatile attacking midfielder, Jason Marcano, ensured that Fenwick had one thing less to worry about with a goal in his third straight outing for the team in black and white stripes. 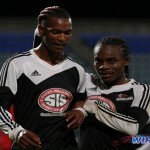 As for the “Teteron Boys”, they return to Couva on Friday night and will hope for better luck against San Juan Jabloteh. A loss could mean curtains for their title hopes. Before kick off, there was a touching gesture from the Defence Force squad as Russell presented a framed, autographed shirt to Roston, Dianne and Tyrell Fletcher—the siblings of former player, Rawle Fletcher, who was gunned down on 22 December 2014. Photo: Tyrell, Roston and Dianne Fletcher, brothers and sister of slain Defence Force player Rawle Fletcher, receive a token from coach Ross Russell (second from right). But Central had no intention of following anyone else’s script this evening. Young winger Samuel Delice, who started the season with Defence Force, could have had a hattrick in the first half hour. Delice failed to connect with a dangerous low Marcano cross that only needed to be nudged over the goal line in the first five minutes. Then, in the 25th minute, he was stripped by Rodell Elcock inside the opposing box after being teed up by Plaza. Two minutes later, Plaza again played a pass into Delice’s run and, on that occasion, the teenager thumped his shot off the bar. Wily veteran Marvin Oliver was not nearly as wasteful as he hooked into the corner for the opening item in the 34th minute. Again, Plaza was the architect after Defence Force failed to clear a Marcano free kick. Defence Force had one peek at goal in the first half but Devorn Jorsling was lunging in and could only redirect Kevon Carter’s cross hopefully. And Central custodian Jan-Michael Williams is far too experienced to be caught out by anything half-hearted. Carter threatened sporadically this evening but failed to land a telling blow against Central. Carter had a better chance in the 71st minute after a rare flowing move culminated in a curving Jerwyn Balthazar cross into the area. But the Defence Force winger could not get enough power behind his header and Williams’ comfortable was rewarded for himnot leaving his feet too early. 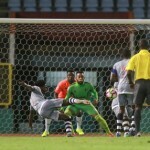 Seconds later, Central doubled its lead as substitute Johan Peltier chipped the ball over the square back four and Marcano took full advantage with his sixth goal this season. DIRECTV W Connection’s Joevin Jones is the only midfielder with more items this season—Jones has seven—although Marcano does not have the freedom to swap places with his strikers as Jones does from time to time. 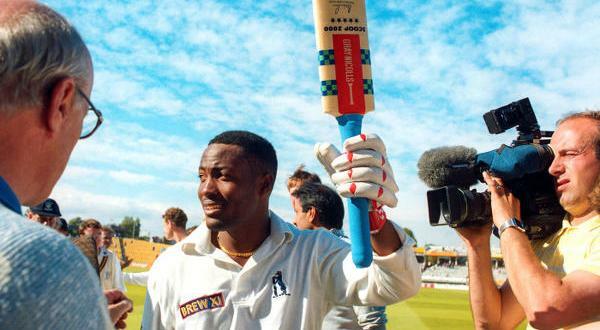 Still, the best player on the field wore the Defence Force’s baby blue shirt. Curtis Gonzales was the epitome of authority in central midfield where he seemed to single-handedly repel Central’s thrusts through “middle earth” while his measured passes stood out in a scrappy game littered with unforced turnovers. There was nothing to show for Gonzales’ work today. 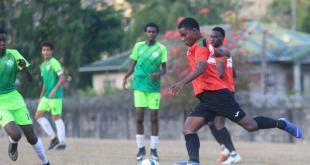 Russell will hope that Friday evening against Jabloteh will be different. Central FC (4-1-4-1): 21.Jan-Michael Williams (GK); 12.Jamal Jack, 2.Elton John, 50.Yohance Marshall, 3.Keion Goodridge; 6.Leston Paul; 7.Jason Marcano, 11.Darren Mitchell, 10.Marvin Oliver (captain), 27.Samuel Delice (13.Johan Peltier 64); 1.Willis Plaza (9.Dwight Quintero 87). Unused substitutes: 25.Javon Sample (GK), 15.Kaydion Gabriel, 18.Kevon Goddard, 20.Nicholas Dillon, 24.Akeem Benjamin. 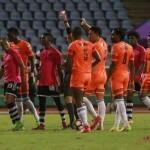 Defence Force (4-2-3-1): 25.Sheldon Clarke (GK); 14.Cory Rivers (captain), 5.Devin Jordan (3.Keston Williams 64), 6.Rodell Elcock, 17.Ross Russell Jr; 15.Jerwyn Balthazar, 8.Curtis Gonzales; 12.Jemel Sebro (23.Kerry Joseph 65), 10.Josimar Belgrave (26.Richard Roy 73), 11.Kevon Carter; 9.Devorn Jorsling. Unused substitutes: 4.Dave Long, 18.Sean Narcis, 21.Aklie Edwards, 70.Dwyane Thomas.